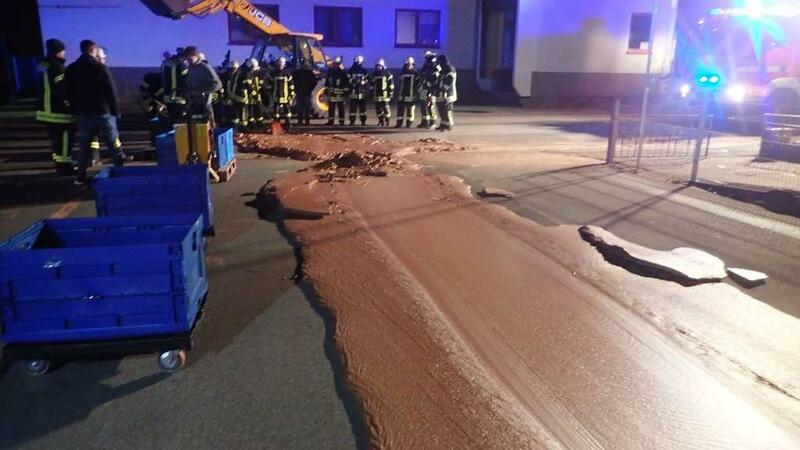 There was one sweet mess in the German town of Werl on Monday, when liquid chocolate seeped out of a factory and onto the street. A storage tank overflowed at DreiMeister's chocolate factory, and the molten candy seeped through the gates, freezing on the cold pavement and leaving firefighters with one big headache. "About a ton of chocolate ran out into the yard and from there onto the street, " a spokesman for the Werl Fire Brigade said in a statement, translated from German. "A ten-square-meter choco-pancake formed." The flood of chocolate became quite a traffic hazard, leaving firefighters with no choice but to break out their tools. They "eliminated the sweet danger with shovels and muscle power," the department said. But chocolate lovers don't have to worry — despite the mishap, there's apparently plenty more chocolate left. Or as the fire official put it: "Despite the heartbreaking incident, it is unlikely that a chocolate-free Christmas is imminent in Werl."